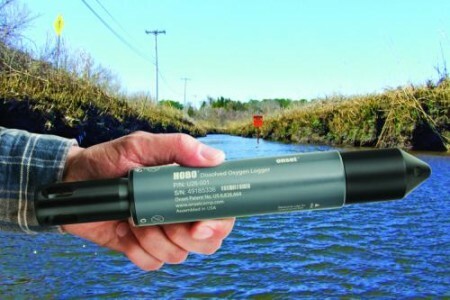 The HOBO U26 combines the high accuracy, robust performance of industry-leading RDO® Basic (Rugged Dissolved Oxygen) sensor technology with an easy-to-maintain design. NOTE: If you need to measure DO in saltwater environments, salinity or conductivity measurements are required. If you need DO in Percent Saturation, barometric pressure data is required, which can be logged with a HOBO Water Level Logger (U20-001-04). Based on Cape Cod, Massachusetts, Onset has been designing and manufacturing its data loggers and monitoring solutions on site since the company's founding in 1981. Specialising in miniature, battery powered solutions, Onset data loggers are exceptional quality and value, ranging from indoor to outdoor and underwater applications. HOBO® data logger and weather station products are used around the world in a broad range of monitoring applications, from verifying the performance of green buildings and renewable energy systems to agricultural and coastal research.